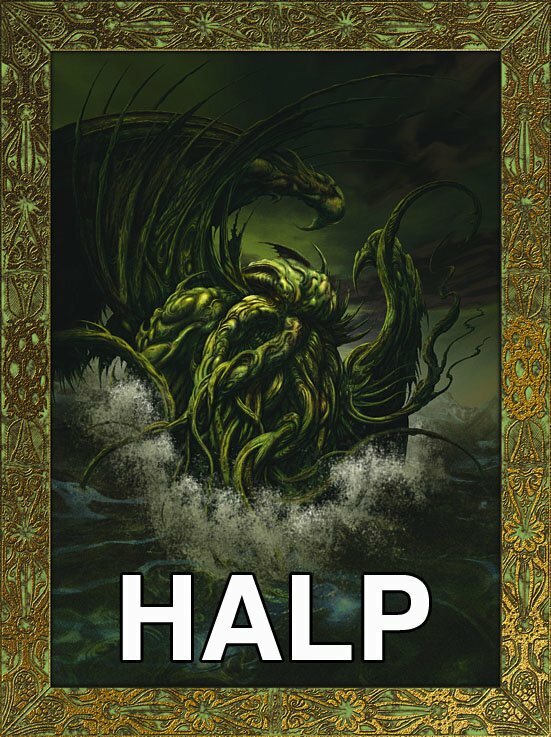 Oddly, the water does seem to hold a good deal of problems for Cthulhu. In Lovecraft’s original tale, it seemed fairly reticent about taking the plunge to pursue the visitors to R’lyeh, and it was on the sea he met his minor setback. Doubtless, he’ll be needing an aeon or two of rest to sleep off the rude awakening from being pulverized by the vessel and having to pull himself back together. I had actually always thought of the “HALP” as coming from the poor “photographer” of this hideous scene, watching such a Thing arise from the deep. I suppose either interpretation works. I used to be an avid fan of Cradle of Filth, and I have this T-shirt, except with “Cradle Of Filth” printed up top in an eccentric, gothic style. For years, I have NEVER known what this is a picture of. Ahh, my ignorance for the Cthulu shows. I could never, for the life of me, figure out what this is. Now I see the epidermal wings and squid-like silhouette.